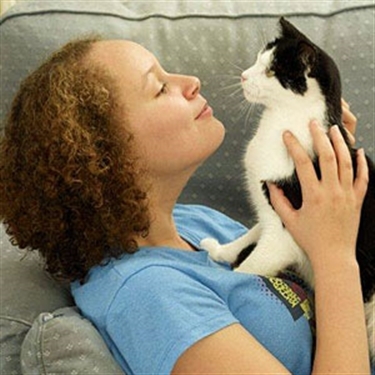 Visitors to the Cats Protection stand (F5) at the inaugural Brighton Mind Body Spirit Festival, taking place from 1 – 3 November at the Brighton Centre, can look forward to discovering how their lives could be enriched by helping a cat in the charity’s care. Visitors will be able find out about supporting Cats Protection’s work by adopting a cat, volunteering or taking part in the charity’s new ‘Sponsor a Cat’ scheme. As little as 19p per day will help towards providing food, shelter, healthcare and loving care for one of thousands of unwanted cats in the charity’s care. The charity’s staff will also be on hand to chat to stand visitors about all things feline, such as whether black cats are lucky or unlucky, and to provide cat care information. For those looking ahead to Christmas, a wide range of attractive merchandise for cats and humans alike will be available for purchase! “We are looking forward to meeting mind, body and spirit enthusiasts in the South who have a passion for cats and who may wish to support our work” said Emma Osborne, Cats Protection’s Events Manager. A host of Cats Protection survey findings prove the psychological benefits of owning a cat. A feline friend can be the ultimate stress-buster with most owners questioned saying they would prefer to snuggle up to their cat than have a massage (66 per cent), phone a friend (64 per cent) or have a drink (52 per cent). 1. Cats Protection recently launched a’ knitting bee’, where cat lovers are invited to knit a new blanket or knitted mouse toy for unwanted cats, and the popular Cat-Battler knitted mouse pattern, originally designed by Lauren O’Farrell (www.whodunnknit.com), can be obtained at the show. 3. Cats Protection’s registered charity number is 203644 (England and Wales) and SC037711 (Scotland). The charity’s vision is a world where every cat is treated with kindness and an understanding of its needs. 4. Founded as the Cats Protection League in 1927, the charity adopted the name Cats Protection in 1998. We ask that you use the name Cats Protection when referring to the charity in all published material.